Welcome banner for IPJ director at Gabes University. Magda Abu-Fadil lecturing on media empires at Gabes University’s Centre Culturel Universitaire in southeastern Tunisia while President Mabrouk Montacer looks on. Abu-Fadil chatting with Tunisian journalists at the U.S. Embassy in Tunis. Abu-Fadil, keynote speaker at media ethics conference in Tunis. (L-R): Abu-Fadil, U.S. Ambassador to Tunisia William Hudson; Arab Institute for Human Rights president Al Tayeb Bacouche; Dr. Salwa Charfi, media professor at Tunis University; and U.N. Information Center Officer Amor Nekhili. 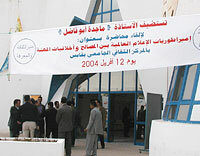 Faculty and senior students at Tunis University’s journalism school. IPJ director after online journalism workshop at Tunis University’s Institut de Presse et des Sciences de l’Information. IPJ director Magda Abu-Fadil lectured, conducted workshops and spoke on ethics at media-related events in Tunisia as a guest of the U.S. State Department’s Africa Regional Service bureau. During the April 9–16, 2004 trip, she first lectured on “Media Empires: Between Profits & Professional Ethics” at Gabes University’s Centre Culturel Universitaire in southeastern Tunisia to a capacity audience of academics, students and local authorities (PDF). Gabes is a five-hour drive from the capital Tunis. Back in Tunis, Abu-Fadil was part of a roundtable with young Tunisian journalists at the American Embassy, addressing issues of press freedom, media ethics and globalization. Journalists discussed limitations they faced in their daily reporting and shared experiences about frustrations in trying to counter government restrictions on access to information. Another half day was set aside for a media ethics conference at the capital’s Sheraton Hotel during which Abu-Fadil was the keynote speaker. The event was attended by journalists, academics and members of NGOs. The speakers’ panel included U.S. Ambassador to Tunisia William Hudson; Arab Institute for Human Rights President Al Tayeb Bacouche; Dr. Salwa Charfi, media professor at Tunis University; and U.N. Information Center Officer Amor Nekhili. Abu-Fadil later went to Tunis University’s Institut de Presse et des Sciences de l’Information where director Mohamed Hamdane received her before she conducted a workshop on “Pan-Arab Press/Online Journalism/Media Convergence” for senior students. She returned to the institute the following day for another workshop for students specifically dedicated to online journalism. The trip was organized by the U.S. Embassy in Tunisia.